The first modern trampoline was created by George Nissen in 1936. Two years later, Ed Russell created the first fitness trampoline but gave his ideas and prototype to Victor Green. Victor then patented the small trampoline in 1975. By 1976, American companies started to manufacturer the same size of trampolines, which became popularly known as rebounders. By 1984, rebounding had already become one of the most popular sports in the United States of America, with more than a million fitness trampolines selling every year. 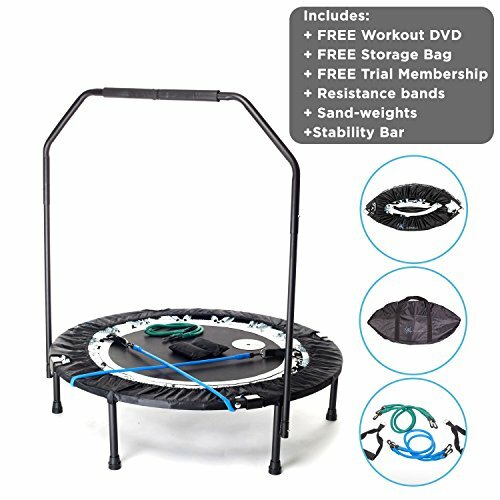 Today, the increase in interest in rebounding isn’t only because of the improved quality of the modern fitness trampoline, but also due to the health benefits of using them. Moreover, fitness trampolines are the best alternative to larger trampolines because they are lightweight, very easy to move around. They are also compact so they take up less space. And some fold down easily for easy storage. What are the best examples of rebounding exercises? What are the health benefits of fitness trampoline? Rebounding is a low impact workout routine that you can engage your body in without the need of a personal trainer. And while it may not burn more calories like many high impact workout programs do, it can still contribute a great deal to your fitness regimen. With that said, below are examples of trampoline exercises that you should try. Jumping Jacks are quite a common exercise. You’ve probably done it over and over again in a soccer field, at home, or maybe even in an elementary gym. You can do the same exercise on a rebounder. You can do this exercise with or without dumbbells. But it is best to start without. Once you get used to balancing your jumping, then you can use the rebounder alongside some dumbbells. Front/side arm raises is a very simple exercise that you can include in your regular workout routine. You would typically perform these exercises before other high-impact exercises. Generally, front/side arm raise not only ease your jumping on the fitness trampoline, but also warms up the joints of your shoulders. Because core rotation works well for the abdomen, the exercise can help you to tone and build the strength in your core. In this exercise, you bounce on the trampoline while rotating your arm and torso from one side to another. You can do this for as long as you like, but a minute or two is more than likely enough. Squatting and balancing your body on a mini trampoline can be challenging at first, but it should be easy once you figure how to engage your core muscles, and in particular on the flexible surface of the trampoline. Like core rotation, the abs rocks workout lets you exercise your core muscles which help stabilize the rest of your of your body and help build good posture. Combined, and done for at least 2 to 3 minutes for every workout session, the two exercises can work your belly and help a great deal to burn fat. It is important to remember that the fitness trampoline became quite popular because of the advancement in material quality, improved design, as well as health benefits. Below are some of the health advantages of the trampoline fitness. One of the best things about regular rebounding is that it helps to improve the health of your heart. It is linked to better respiration as well as improved heart strength and function. Sure, rebounding is a low impact exercise. Alone, it cannot help you lose a lot of weight. But if combined with other high impact exercises, together with a healthy diet, a mini trampoline workout can contribute a great deal in helping you get back into shape. If weight loss is not your goal you can still do rebounding to help maintain your fit body. Since regular rebounding helps to increase the regular circulation of lymph fluid, it can not only help your body detox more quickly, but also boosts your immune system ensuring greater activity of the white blood cells. Never place a mini trampoline close to potential hazards like trees, washing lines, or fences. And make sure the area where you would like to put the rebounder is as flat as possible. Unless you have a crash mat in place, you should never put the trampoline on a hard surface like concrete or asphalt. To prevent the risk of falling over and hitting the ground, consider buying a mini trampoline with a safety net, especially if you are a beginner. Never allow more than one person to use the trampoline at a time. 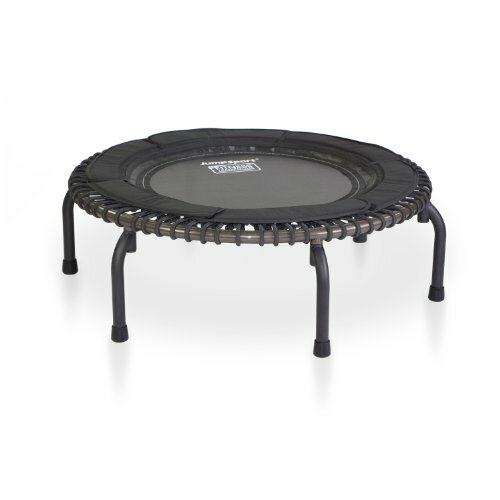 With a 44-inch diameter, which gives you about 1,334 square of a rebounding surface, the 370 Pro is the biggest fitness trampoline in JumpSport rebounders range. Although it is commonly found in gyms and used for professional purposes, the 370 Pro is a multipurpose fitness unit that you can use it on your patio or your home gym, provided you have enough space to accommodate it. With a weight limit of 300lbs, almost anyone can take advantage of this mini trampoline for low-impact exercises. This rebounder features petal spring covers, arched legs, heavy-duty 16-gauge steel tubing, and it is triple coated to prevent rusting. JumpSport 370 Pro also features EnduroLast XF, which is simply a 7-level cord that you can easily adjust depending on your workout level. If you set the tension of the cord higher, the trampoline will become tighter, hence suitable for what’s called a running workout. Unlike the 550F model that you can easily fold away and store under a bed, the JumpSport 370 Pro doesn’t fold and it is therefore not recommended for people who are limited on space. Although the quality of this unit is good, it is quite pricey. So, if you are in the market for a budget mini trampoline, this is not for you. If you are in the market for a fitness trampoline that can give you the most value for the money, then the Needak Rebounder may be a good option for you. This one is designed to do two things: to take pressure off your ankles and to minimize the impact of each bounce. The average weight limit is around 300 pounds, but that’s only for a soft bounce. If you are planning to use this for a soft bounce, then you can be sure that it can take over 300 pounds. Some people have argued that the bar of this rebounder goes through the middle. That’s not the case with this unit at all. Instead of crossing the middle, the stabilize goes across the trampoline. And the benefits are twofold. First, you get the place to stand and you more than likely have the full use of the jumping surface. Second, the bar goes across so that you can use it if you need the support to stand steadier on your feet. Setting up this mini trampoline is so easy that you can do it on your own, even if you have never bought one before. Thanks to the instruction manual that shows you how exactly to put all the parts together, it should take less than 10 minutes to assemble. If this is going to be your first time ever to use a rebounder, then you should consider buying the best starter trampoline. In addition to the mini trampoline, the package includes an exercise DVD, a carry-on bag, a set of weights, and exercise resistance bands. MaXimus Pro Quarter is lightweight and compact, a good option for people that are limited on space. Moreover, it is foldable, which means you can store it away when it is not in use or bring it with you wherever you want to go. The MaXimus Pro Quarter has a weight limit of 300 pounds and it is recommended for every day training activities. In terms of age, this is best suited for ages 16 years and above, although kids can also use it but only under close supervision. 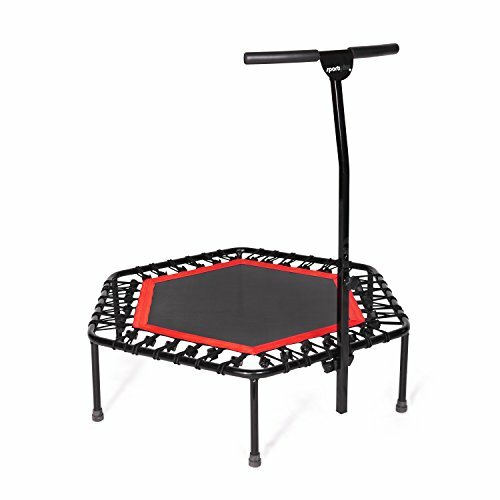 The SportPlus Silent Fitness Mini Trampoline is one of the best inexpensive rebounders with an easily-to-adjust handrail bar. Because it is foldable, it is easy to store away. Because it is lightweight after folding, it is easy to bring with you wherever you want to go – and often good for travel. The bungee protects you from falling off the trampoline during the rebound. The adjustable handrail can help you maintain the stability of your body when bouncing. And the perfect foam balance makes a good option for aerobic workouts. 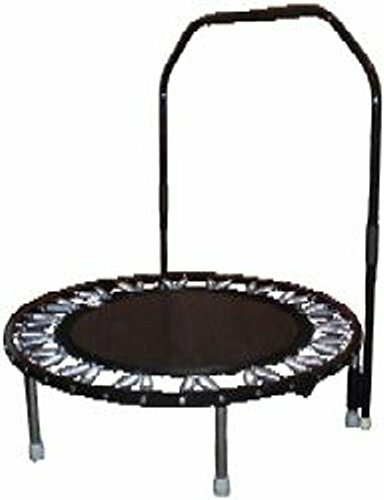 Unlike other trampolines on our list, SportPlus Silent Fitness Mini Trampoline only has a weight limit of 286 pounds. Always put safety first when using a fitness trampoline. You want to avoid unnecessary trips to the hospital as much as you can. And the best way to do that is to consider the safety tips that we have provided, so that you can enjoy all the health benefits of rebounding instead. If you're looking for the best premium trampoline we recommend the JumpSport 370 Pro and if you're just starting you can’t go wrong with the MaXimus Pro.